QUICK FIX: GLAZED CARROTS | Jane Lear. Writing on Food and Travel. There aren’t enough hours in the day or enough days in the week, it seems, but that’s life. What keeps things on track in the kitchen are things I can make quickly, with little effort yet a big payoff. The simmered asparagus I wrote about last week is one example, and another is glazed carrots. They are delicious plain (funny how butter does that) with a piece of pan-seared or broiled fish—or just about anything, really. If you’re in the mood to tinker and tweak, though, know that carrots have a great affinity for Middle Eastern flavors. Sprinkle them with a blend of ground toasted cumin and coriander seeds, ground cinnamon, and cayenne or Turkish maras or urfa pepper flakes. We had them that way tonight, with couscous and roasted salt-and-peppered chicken thighs. If you turn on the oven before you take off your jacket (it’s still so chilly! ), you will have supper ready in practically no time. If the carrots are young and on the small side, cut them in half lengthwise; otherwise cut them into thin rounds. Put them in a heavy pan with a little water. Sprinkle with a teaspoonful of sugar or honey, top with nice-sized chunks of butter, and cover the pan. Cook over medium-low heat until water is evaporated and carrots are tender, 10 to 15 minutes. 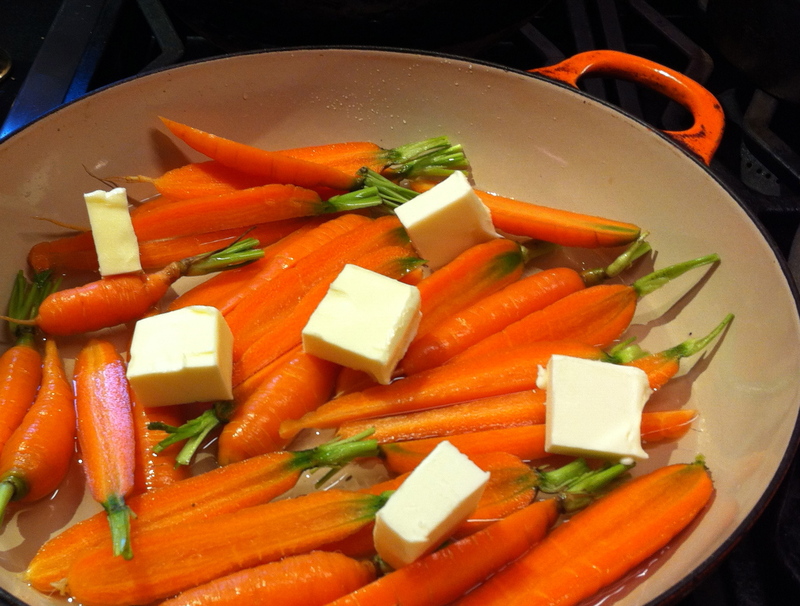 Uncover and increase the heat to medium-high; cook, tossing occasionally, until carrots are glazed, a few minutes more.